But the curiosity about this flower designer was so big I was willing to challenge myself just for a chance to get closer to their work. 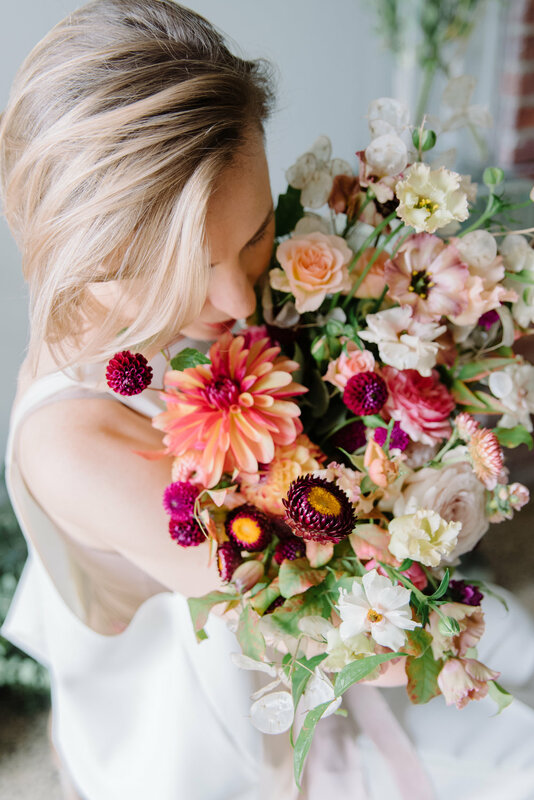 And there I was, so very welcomed by TJ and Paulina of Blue Jasmine Florals- which I learned were also South American - in this dream flower studio. I resigned last Monday, I resigned from a career that I held for the last 10 years to be home with my daughter(s) - one’s in day care, the other is only 3 months old. A struggle I experienced not just this time but the time before, when I returned after Ellie. I really wanted to make it work, I wanted to do what millions of woman had done before me and be a working mother. What I was failing to see is that I could still work, just not in that role. I decided to pursue this career, being a photographer. And in the very week when I closed one door, a new one opened. And the below images are evidence of how bright and bold my future can and will be. And how these flowers make me feel when looking at them is similar to the feelings I get when I think about being given a unique opportunity to be home with my girls - happy, cheerful, hopeful. If you would like to collaborate, send me a message! !